You know how I said that the next dish would be summery and vegetarian? Well, this one is neither. Maybe a little bit summery but definitely not vegetarian. Not even suitable for those fake-veggies that eat fish but not meat. See, I was going to make something summery and vegetarian, but when I told Alex what I had in mind he said that I would be cheating if I made it. Apparently I promised to make things I’ve never made before. What was I thinking?! Anyway, a promise is a promise. 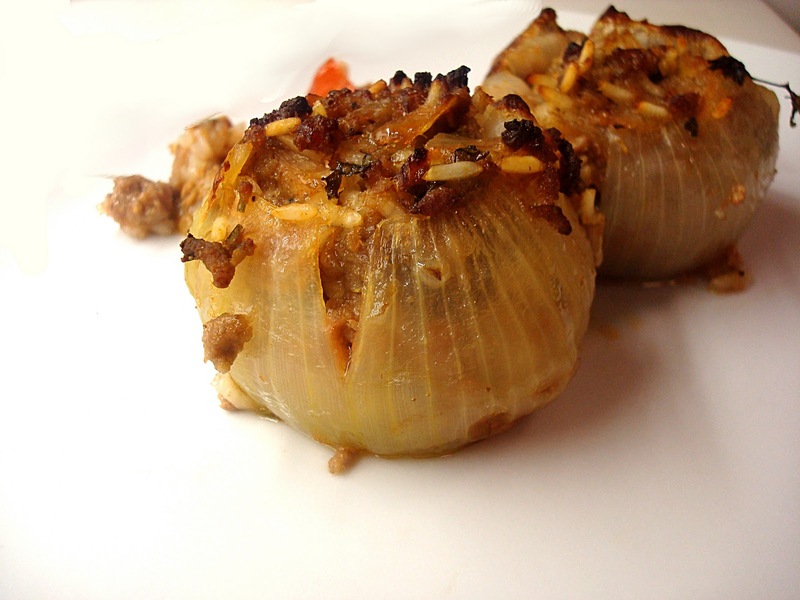 Get ready for some stinky food, since dinner tonight is Stuffed Onions. I am not sure which area exactly they come from, since they are so many different versions of them around the internet. Most of them say they come from the Dodecanese, so pick your favourite island. 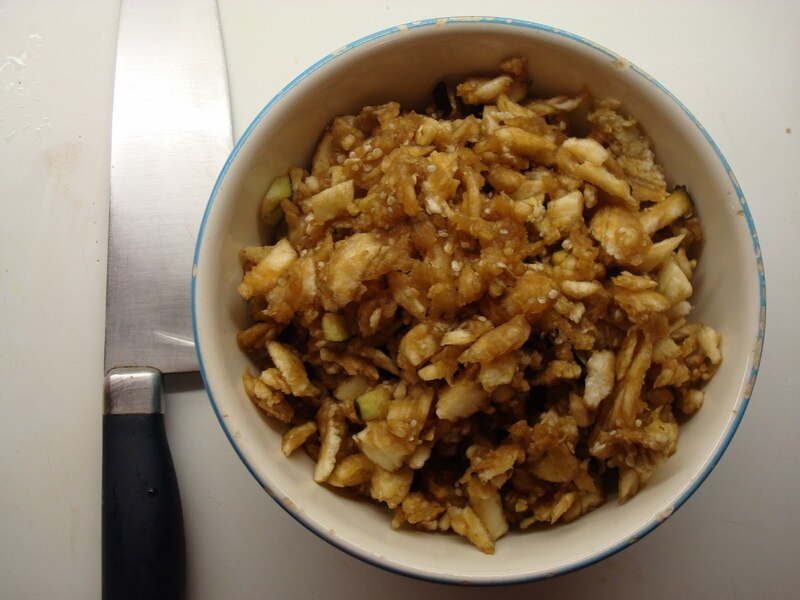 They recipe I chose is the one from Elias Mamalakis’s website. It’s in Greek, so I’ll re-write it here in English. I’ve made a couple of changes too. To prepare the onions: Slice off the ends and peel them. You want to cut a larger bit from the top (the side where green things start growing out of if you leave them for too long). Boil them whole in salted water for about 20 mins, or until soft. Take them out, let them cool down so that you can handle them and pull out a couple of layers from each one. Put them on a tray and chop up the insides. For the aubergines: You can either chop them up whole or, if you want to stuff them too, remove the flesh and set them on the side together with the onions. 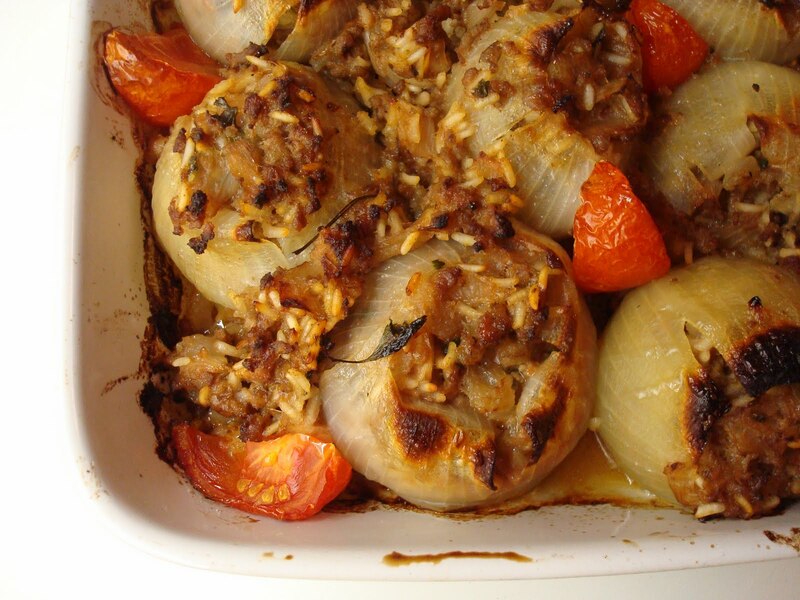 For the filling: In a large pan, fry the chopped onions and aubergines with some olive oil. When they are soft, add the mince and fry until brown. Then add the rice and the wine and boil until the alcohol evaporates. Next, stir in the tomato puree and some water, let it boil once more and remove from the heat. Mix in the chopped parsley. 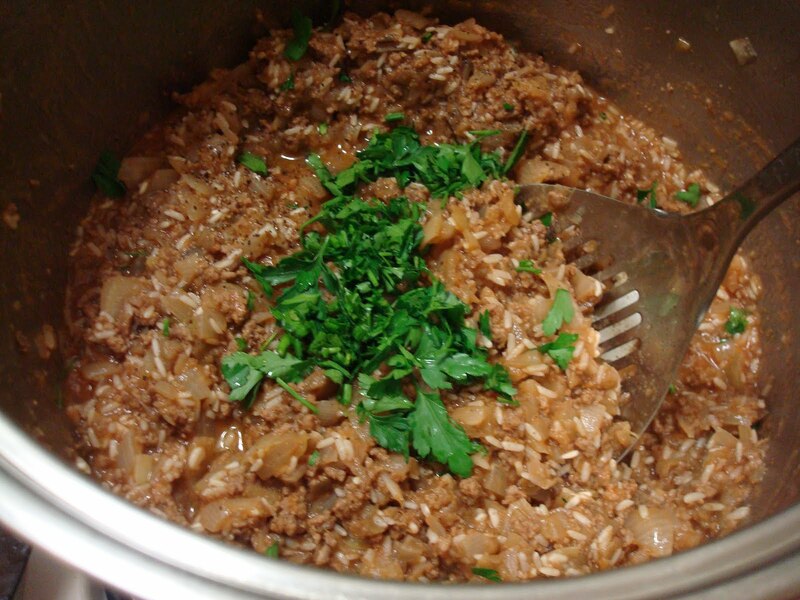 When the filling has cooled down a little bit, fill the onions (and the aubergines, if you have some) with a teaspoon. You will probably have too much filling, which is good. Put the rest around the onions, it will get really nice and sticky after it cooks. 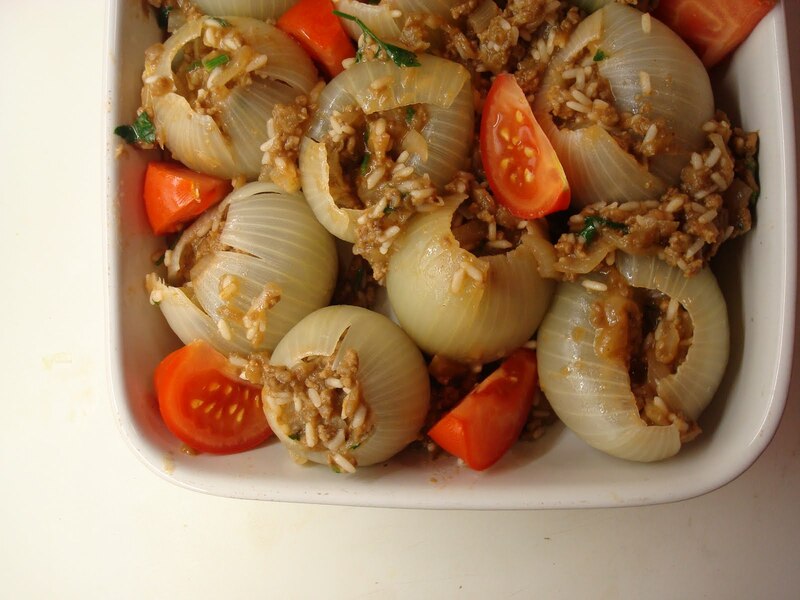 Cut the tomatoes in wedges and arrange them around the stuffed onions. Drizzle with olive oil and some more water, cover with foil and let it cook in a preheated oven for at least an hour at 170 degrees. Uncover and let it brown for a further 15 mins. Serve with bread and some feta cheese if you like. I claimed at the beginning of this post that I am making something I’ve never made before, but it’s not strictly true. 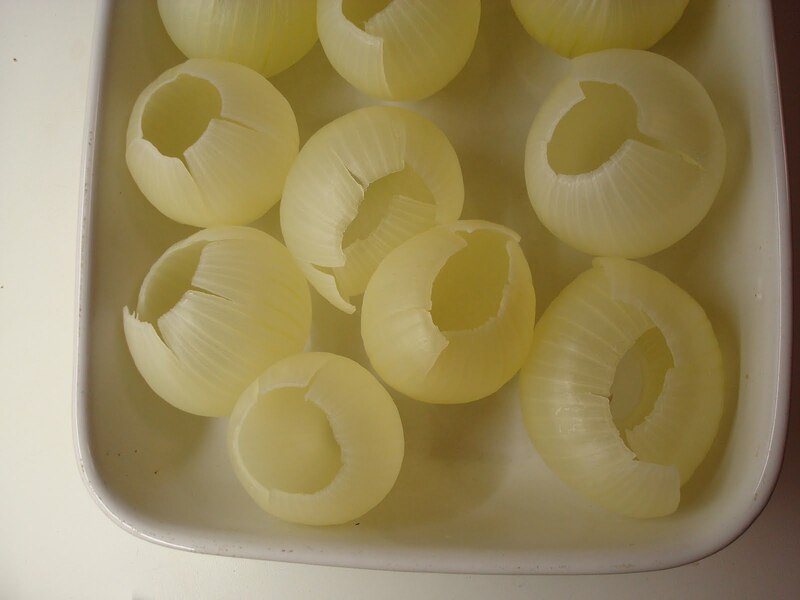 I have never stuffed onions, and they were nice, although a bit annoying to peel when hot. But I’ve made the filling many times before. You can use it to stuff all kinds of vegetables like aubergines, courgettes, peppers or tomatoes. Just remove the flesh and use it in the filling (well, apart from the peppers!). This dish is best served after it has cooled down to room temperature. If you can wait! Next time on Round the World in 100 Recipes: A treat from Crete!